The Harmony Park playground off Gaffney Street in Coburg is not a new playground however it was new to us and little Miss enjoyed it! 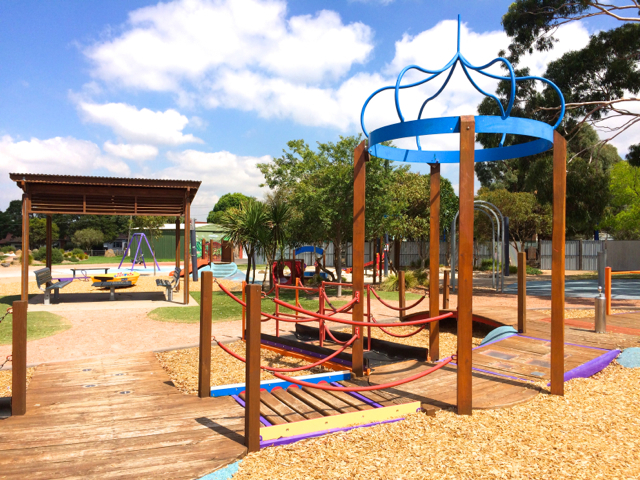 It is a large playground with lots on offer - swings, a seesaw, slides, a boat, some climbing gear, musical play with tires that sound like musical instruments when jumped on and a big sandpit area with a sand digger. Note: There is currently no shading over the playground as it is being repaired. There is also some construction work on Gaffney Street so avoid parking there. We parked in Bishop street which is nice and quiet and you can walk to the playground without any traffic. Harmony Park is located at 187-195 Gaffney Street in Coburg.